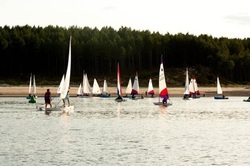 By the end of the Stage 3 course you will be safety conscious and be able to sail a dinghy confidently in light winds. Sailing predominantly in Taz and Topaz you will practice sailing backwards, forwards, upwind, downwind, tacking and gybing to your hearts delight and master of your own boat. Rigging, launching and recovery, sailing techniques, capsize recovery, sailing theory. Up to and including Youth Stage 2.